The web is noisy. Are you breaking through? Is your business attracting the right prospects? How well do you engage interested prospects with compelling offers? Are you converting qualified prospects into profitable customers? Are you growing and building your customer relationships for long-term growth and profitability? These are big questions, but the web is a big space where fresh ideas in marketing can take root and prosper. 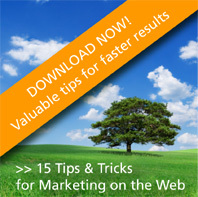 At Vital Marketing we specialize in breaking through the buzz of the web to generate more leads and to build business. Fresh ideas for attracting and engaging interested customers in today's digital age. Check out our blog -- it's loaded with new insights, tips and techniques for attracting and engaging interested customers. © Copyright 2012 Vital Marketing, Inc. All Rights Reserved.